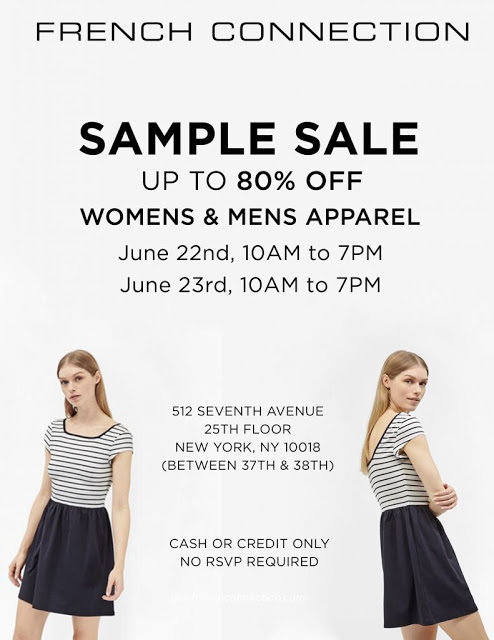 It is officially summer and the sample sale season shows no signs of winding down. More and more events are popping up on a daily basis and there’s roughly 20 something sales today alone! Now you know that I don’t list every single sample sale out there, who’s got the time?! Or the energy! Instead I try to curate the best of the best, what appeals to me personally (and hopefully you as well). 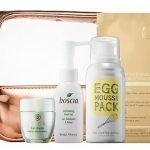 French Connection‘s summer sale offers pretty amazing prices. Everything is just $30 or less with discounts of more than 90% off retail. Thanks to my mom you can read all about it right here. 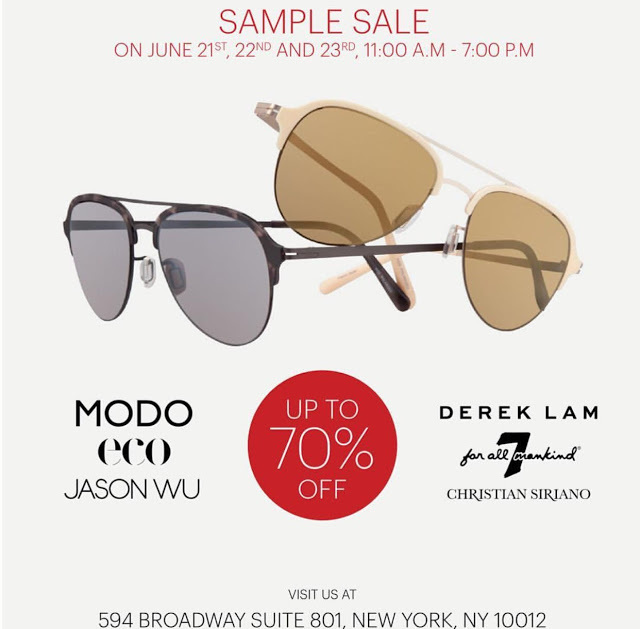 Modo eyewear sample sale ends today at 7pm. As usual all optical frames and sunglasses are only $20. These include Derek Lam, Jason Wu, Modo, Eco, Seven For All Mankind, and new addition: Christian Siriano. The sale is CASH ONLY so don’t forget to hit an ATM first. 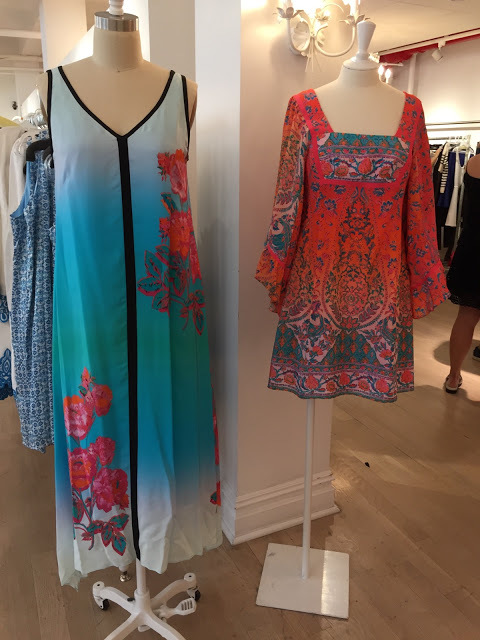 Read my reports from their previous sample sales here and here. 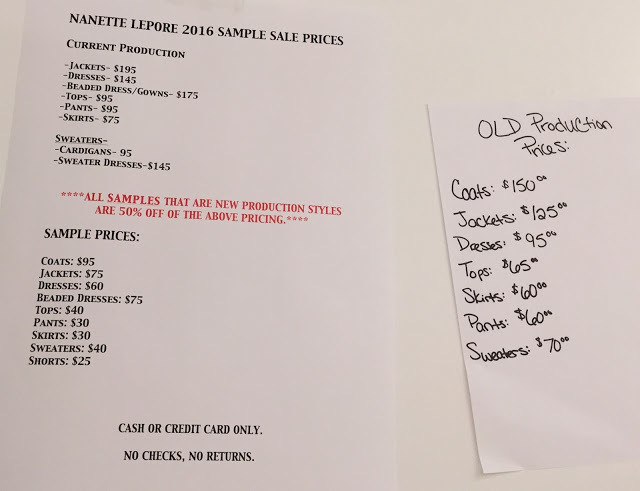 Also ending today is Nanette Lepore‘s vintage themed sample sale. My mom stopped by yesterday afternoon and found wallet friendly prices on past season merchandise in particular. There was an entire rack of $30 blazers (retail $400+). 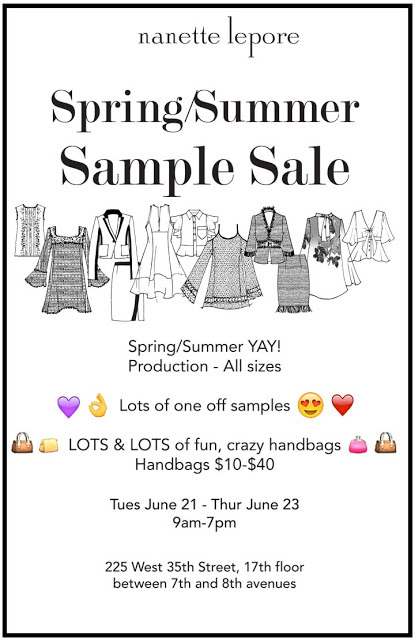 Ahava is hosting the company’s first ever (at least that I’m aware of) public sample sale. Discounts are around 50% off retail but there are some bargain items like $3 hand creams and $5 shower gels. 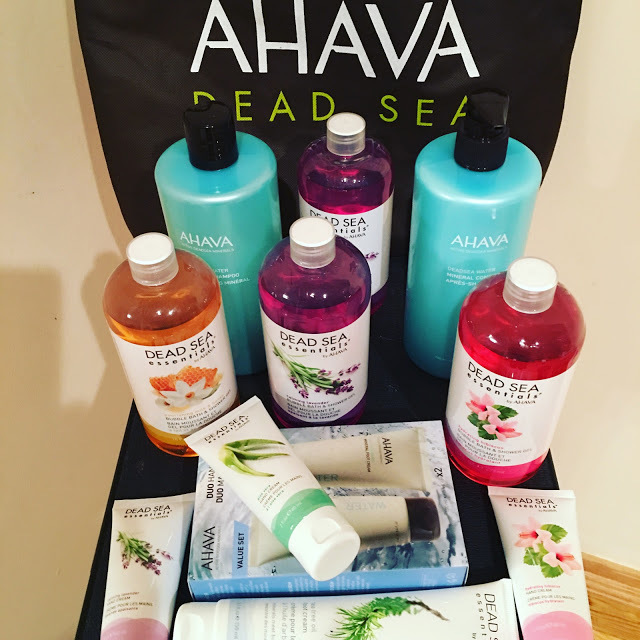 If you’ve ever wanted to try skincare products from the Dead Sea then now is the time! Be sure to price check though as Ahava is available at many discount outlets like Nordstrom Rack and Century 21 Stores. 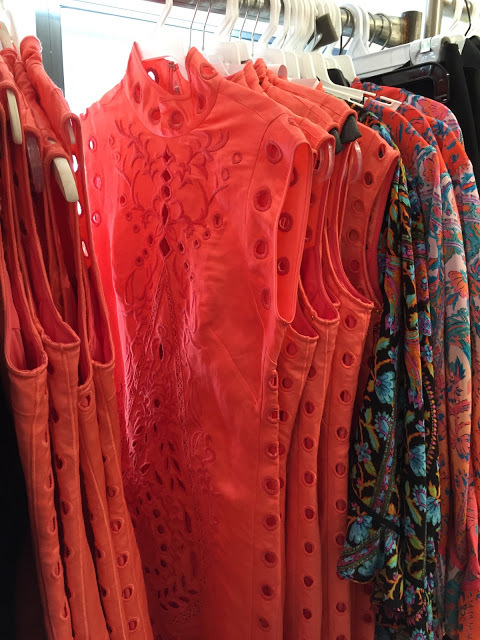 Josie Natori sample sale was a bit disappointing mainly in that the selection consisted of just RTW (no lingerie or sleepwear). Prices were fairly high as well: tops/bottoms $50, dresses/toppers $75, embellished tops $75, embellished dresses and toppers $100, leather $200-$300. Prabal Gurung‘s sample sale offered insane discounts on original samples. We’re talking $25! Of course by now there’s not much left. Stock pricing wasn’t bad either with most items $100 and under. Head over to LeHoarder for the full report. Theory and Helmut Lang joint sample sale now offers an additional 50% off sale prices! 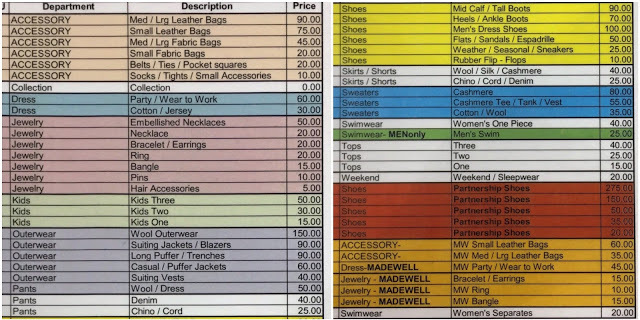 The discounts are great but be sure to inspect each garment as most are damages or irregulars. Restocking is not expected. 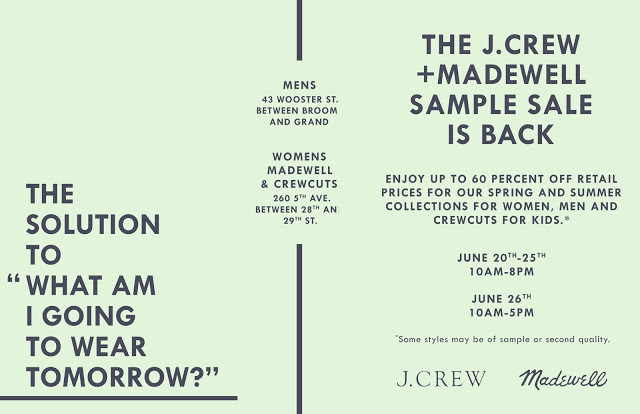 J.Crew, Madewell, and Crewcuts bi-annual sale is still going strong. Prices are slightly lower compared to previous years although collection pieces will set you back $100-$300. The selection is a bit smaller this time, Madewell in particular (menswear has its own location). There have not been any additional discounts yet but I would keep my eyes peeled tomorrow and Saturday. Now for the new sales starting today! 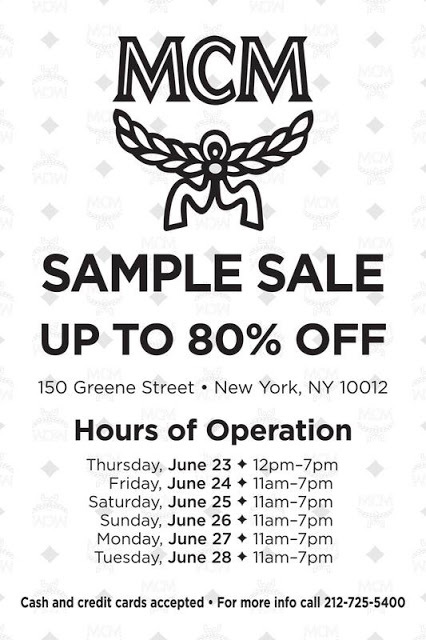 MCM makes the move to 260 Sample Sale although I expect pricing to remain similar to last year. The advertised discounts are as high as 80% off retail but as experience has taught me it does not mean that handbags or accessories will be that low. Instead expect to find select apparel at 80% off while bags will be in the 50%-70% off range. 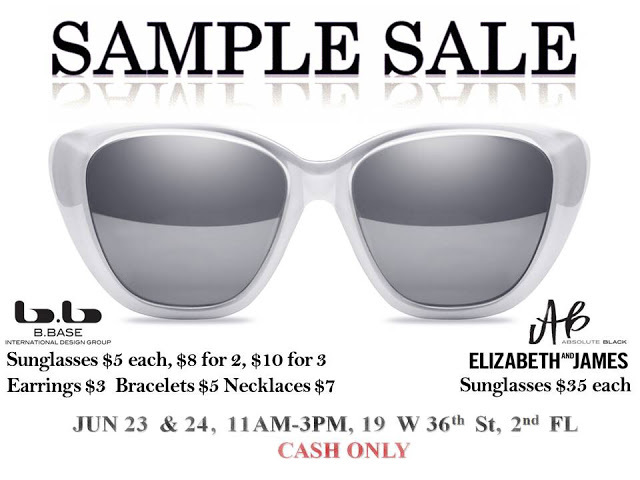 If you can’t get enough sunnies then spend your lunch hour browsing B.Base sample sale. Sunglasses are $5 or even cheaper the more you buy. The Hong Kong based company also manufactures frames for Elizabeth and James. You’ll find both sunglasses and optical frames for $35 (they come with a case!). Also available is Absolute Black jewelry $3-$15. 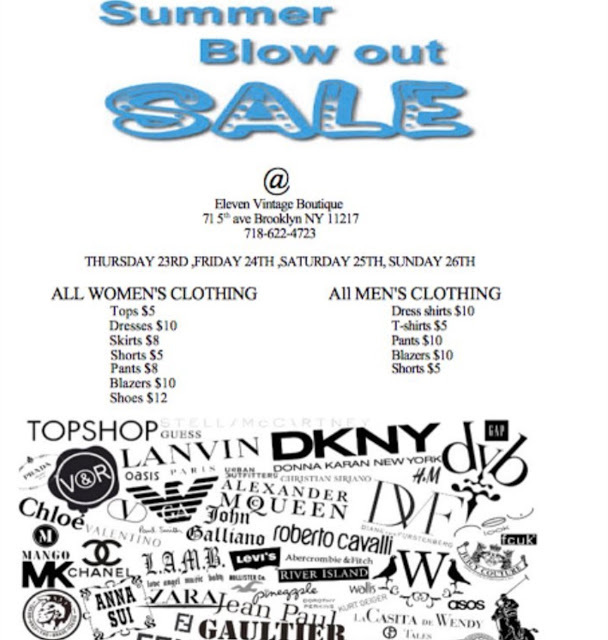 Vintage lovers check out Eleven Boutique blowout sale where everything will be priced $5-$12. 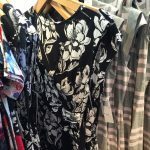 Inventory will consist of vintage designer apparel from the likes of DKNY, DVF, Gaultier, Galliano, Armani, FCUK, Topshop, Chloe, Mango, Valentino, Cavalli, and much more. 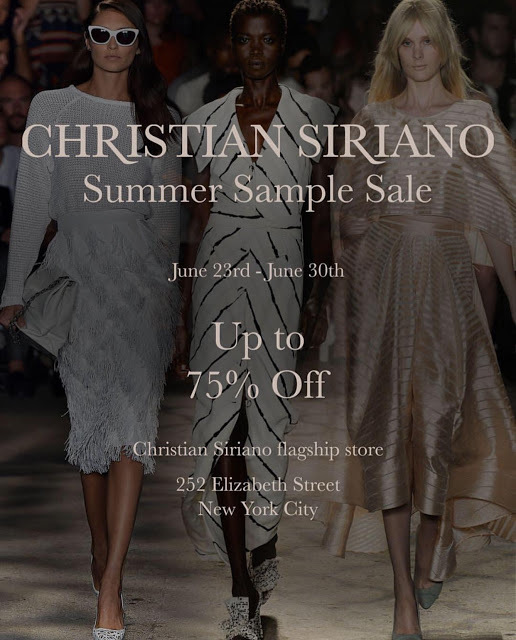 Christian Siriano‘s week long sample sale starts today as well. The organizers promise lots of items in the $100 and under range and discounts up to 75% off. Don’t forget you can get his sunglasses for $20 at Modo. To cap off the evening head to Dannijo for their one day three hour sale. Discounts will be up to 90% off and if it’s anything like their last sample sale, expect to find $10 rings and $25 bracelets.